For more than one decade patients have been treated with dendritic cell (DC) immunotherapy against malignancies and infectious diseases. Proof of principle studies demonstrated immunogenicity and clinical responses were observed in a fraction of patients. Overlooking more than 200 publications one realizes, however, that it is almost impossible to compare many of these trials even in a given clinical setting or disease. This is primarily due to the fact that dendritic cell generation procedures are highly variable. 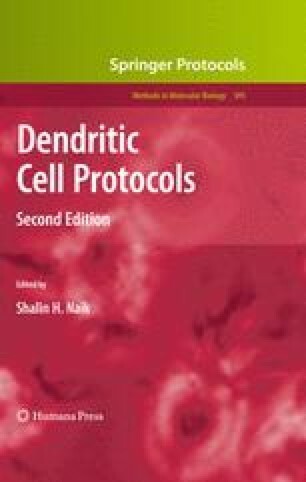 There is a requirement for a standardized DC generation protocol which provides ‘reference dendritic cells’ to which other dendritic cells (e.g. differently matured ones) can be compared to in order to further optimize this promising vaccination approach. In this chapter, we describe in detail our standard DC generation protocols established during the last decade with over 200 melanoma patients treated and over 2,000 vaccinations applied in clinical studies at our hospital. We do not claim that these dendritic cells are the best ones, but the generation procedure is highly reliable and reproducible and provides a standardized reference DC vaccine. This work was supported by grants to Gerold Schuler, Department of Dermatology, University Hospital of Erlangen from the DFG – German Research Foundation (Collaborative Research Centre SFB643, Project C1), the European Union (DC-THERA Dendritic cells & Novel Immunotherapies, Network of Excellence, Project Number 512074) and by the Cancer Immunotherapy (CIMT) EU Integrated Project WP02.02.